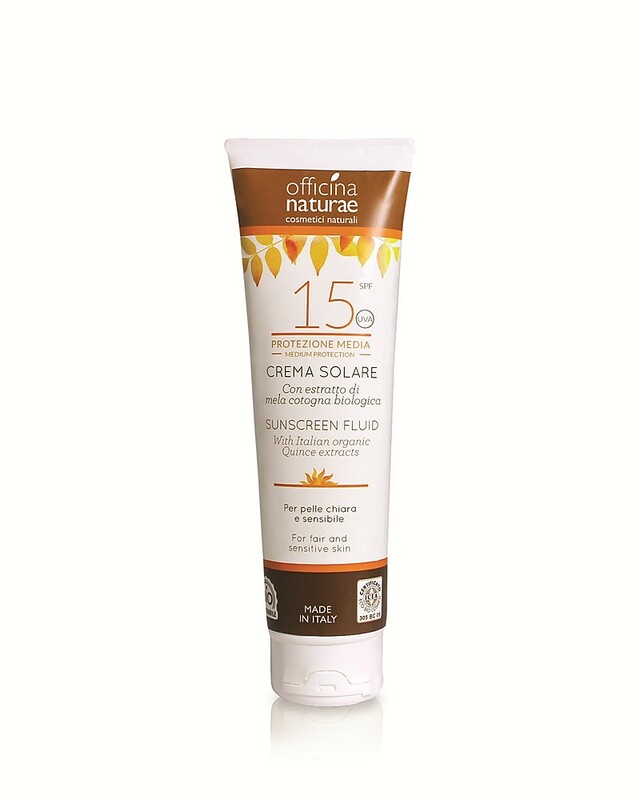 The sunscreen fluid SPF 15 by Officina Naturae is particularly suited for normal and sensitive skin. 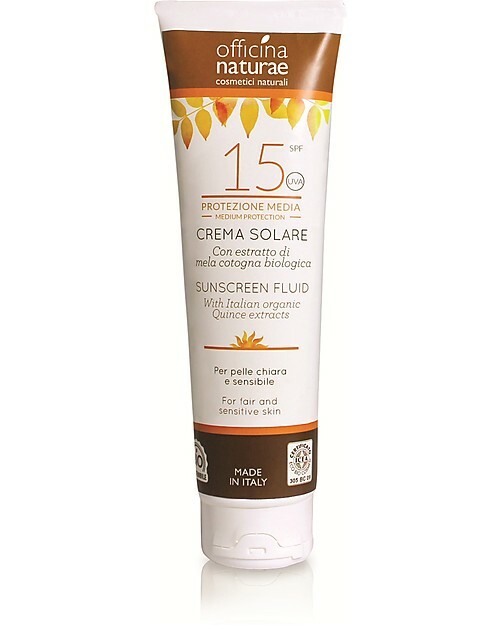 Made with natural ingredients from organic farming is an eco-friendly product containing just natural and mineral sunscreen, excluding chemical sunscreen, detrimental for the marine environment. Its ingredients are, instead, Quince extracts, Carrot extracts and the organic oils of Argan, Sweet almond, Linseed, Coconut and Jojoba that protect skin from sunburn and help to get a homogeneous and durable tan. With certified medium protection factor, this sunscreen fluid has mineral filters only. Formulated without fragrance, it avoids sensitization or allergic reactions during sun exposure. A quality eco bio cosmetic product that takes care of our skin whilst respecting the environment. Officina Naturae is an Italian eco-conscious brand founded by a group of critical consumers. Officina Naturae products are efficient and safe for human beings (including babies!) and the environment. All choices in the production and distribution of Officina Naturae products are inspired by ecological and ethical principles: km 0 ingredients sourced from small Italian companies and from organic farming, green energy-efficient headquarters, packaging made with recyclable biomaterial and eco-design to minimize volume during transport. Officina Naturae is involved in a fair trade project with a Nepalese ONG aimed at helping the poor and socially marginalized Chepang community. Officina Naturae is the 100% Italian brand for your eco-bio beauty and hygiene: their products are efficient, ecological and ethic. Laudry liquids, solid soaps, bath foams, shampoos and all other Officina Naturae products are made with ingredients of vegetarian or mineral origin, often sourced from organic farming. No harmful chemical substances or ingredients of animal origin! Take care of your personal hygiene and clean your house with products that are delicate on the skin, for you and your baby.